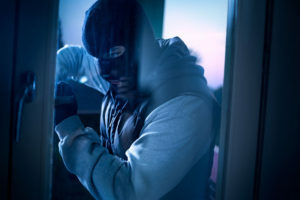 Keep your property safe from home burglaries with these safety tips. Protecting your home from disaster is a must! From keeping up on your home maintenance to investing in the right homeowners insurance, you take plenty of precaution to help make your home safer. However, home burglaries are a common occurrence. Protect your home from the threat of burglary with these safety tips. When it comes to reducing your risk for a home burglary, it’s important not to give someone a reason to break in. If you leave valuables in plain sight, you’re an easy target. Not to mention, it’s important to be wary of what you’re throwing away. Boxes can provide clues as to which valuables you have in your home. Lower your risk for a break-in by keeping all your valuables locked away in a safe and by throwing away wrappings on trash day. When it appears as if someone is home, you’re less likely to experience a break-in. Make it look like someone is always home by turning the lights on. Set a timer so that the porch light and several lights around your home go on and off every night. Plus, ensure that you arrange a hold on your mail and newspapers when you head out of town. Use Landscaping to Your Advantage. Don’t underestimate the power of your lawn. The more unkempt your yard, the more likely you are to experience a break-in. Keep your yard in tip-top shape and use landscaping to your advantage. Put thorny shrubs and bushes like roses under ground-floor windows so that they’re less accessible. Keep your home safe from burglaries by taking the right precautions and investing in the right homeowners insurance. Contact the professionals at Robert J. Los Insurance Agency to find you the right insurance plan. Located in Hamburg, New York, we serve all your personal and commercial insurance needs.